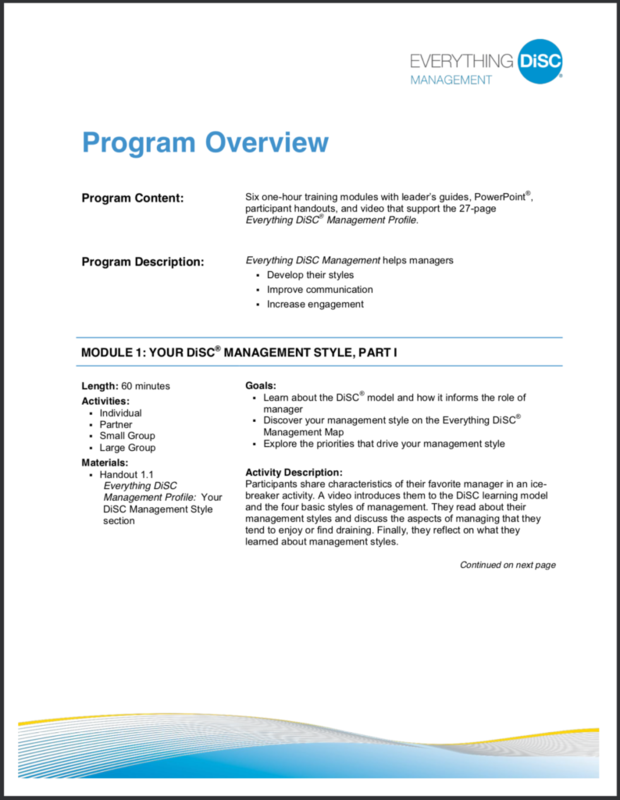 The Management Training is broken out over six 60-minute modules. While possible, it is not recommended that a trainer attempt to deliver all six modules in a single day’s session. Group size and discussion needs will all effect your training session, and trainers need to consider the amount of time participants need to process what they are learning. We have found that a minimum of two days is best to ensure a positive, enlightening management development experience. Given its modular design, Management facilitation can be delivered as a workshop series, with each module serving as a separate workshop. Use this training with current managers who want to continue developing their skills, or as a leadership development training for potential employees that are on track for a promotion. Can I use this training with both intact groups as well as non-intact groups? Yes. 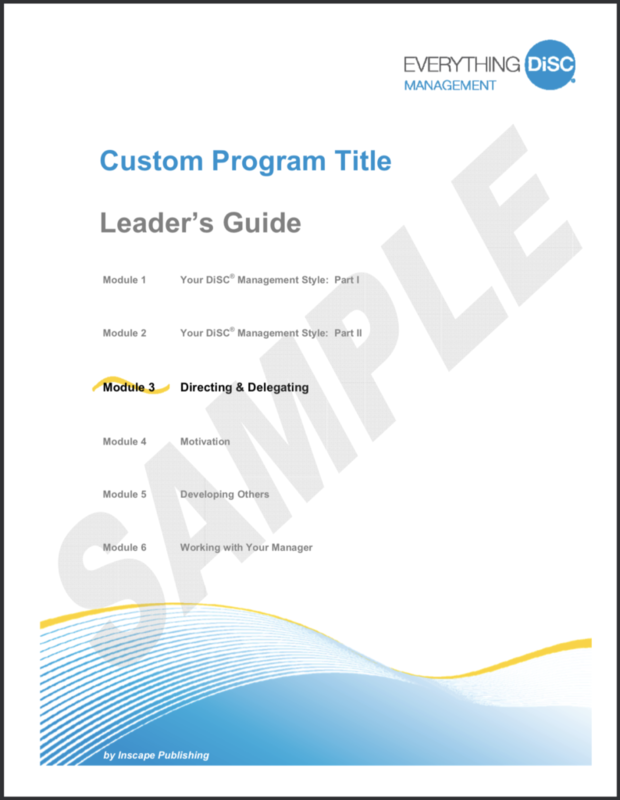 The program mainly helps individuals explore their own management strengths and challenges; however, the activities in the Everything DiSC Management facilitation also help reveal patterns and insights about management within an intact work group. When working with an intact group, you have the opportunity to enrich the program by taking participants’ newfound insights to an organizational level in your discussions. Can the Everything DiSC Management training be delivered in a virtual environment? Yes. However, as you consider how to adapt Everything DiSC Management to a virtual environment; do not underestimate the power of the conversations that are inspired by this training, which are a primary agent for insight processing. Therefore, be sure to design your webinar to use interaction tools to their fullest extent. Limiting your class sizes to 15-20 participants will also help facilitate meaningful conversations in a virtual environment. Our organization uses Adobe Connect to deliver virtual training because it has the ability to place your participants in virtual ‘rooms’ where your participants can discuss topics in small groups. 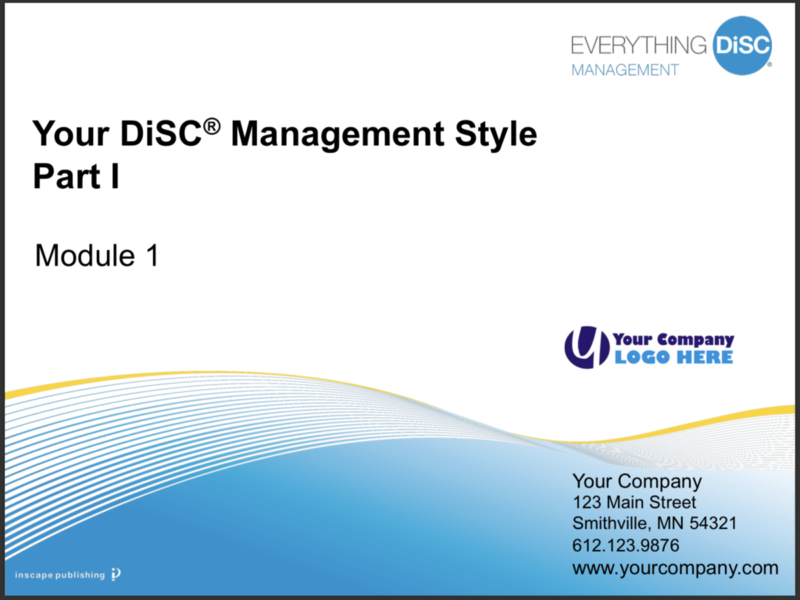 MODULE 1: Participants use the Everything DiSC Management Map to learn about their management styles. MODULE 2: Participants discover how their styles affect how they manage time, make decisions, and solve problems. They learn a method for recognizing the behavioral styles of others as a way to begin to understand them better. MODULE 3: Participants learn about their directing and delegating styles and identify the needs of other people. They write a plan for improving with a specific employee. MODULE 4: Participants explore the environments they create and identify the motivational needs of other people. They write a plan for improving with a specific employee. MODULE 5: Participants learn about their natural style of developing others and identify the needs of other people. They write a plan for improving with a specific employee. MODULE 6: Participants discover their managers’ natural priorities and preferences. They explore different approaches to influencing their managers and write a plan for working better together. Are you looking to become Certified in DiSC? We offer three Everything DiSC Workplace Certification Options. Join us in-person in Lancaster, PA, Online, or in Minneapolis, MN. Pricing varies based on the certification options. All rights reserved. Copyright © 2004–2019 by Online DISC Profile and Center for Internal Change, a division of The Team Approach, Inc.. See Trademark and Privacy Statement. All offerings within our sites are subject to change without notice.